Five years ago today, the very first Friday 4Koma was launched on Omake Theater. It’s been a bumpy road, but still a fun journey, nonetheless. The prior couple of years (ie. 2012 and 2013) were some rocky ones for the site. I’ve tried really hard in 2014 to make up for inconsistencies of the past. If you look at the chart below, you can see that I actually updated more times in 2014 than the two previous years combined. And the year isn’t even over yet! This number isn’t even including the videos, articles and original social media content that I created for the site over the past year, either. 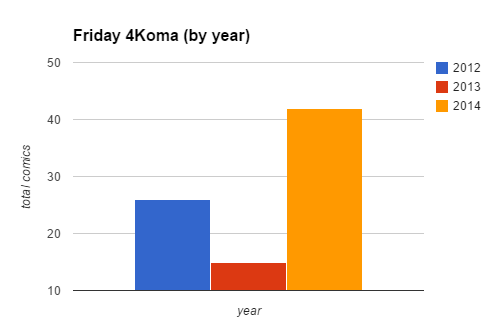 Overall, 2014 has been a pretty good year for Omake Theater. So what does the future hold for Omake Theater? I’ve made a lot of claims in the past about what was going to happen next for this site. At the time I shared my plans, I was almost 100% confident in their accuracy, but, as history has shown, that was not the case. Now rather than make some big claims that I don’t wind up following through on, I will simply say that I have mapped out and planned for a lot of new stuff during Omake Theater’s fifth year. One of which is a new weekly series that begins a few Wednesdays from now. So, if you don’t follow Omake Theater on Facebook or one of the other social media outlets, I highly recommend doing so. Last, but definitely not least, thank you. Your support over the past five years is the reason I create content for Omake Theater and will continue to be the reason for many years to come. Thanks for five great years, and here’s to five more! !